This has become my most favorite, healthy side dish to date! 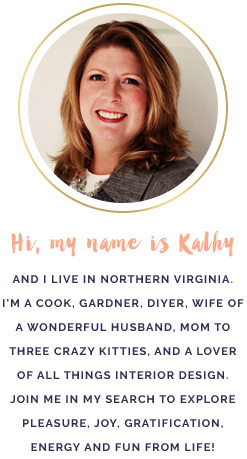 I discovered this recipe in my copy of Cook's Illustrated 2016 Annual Special Collector's Edition magazine and boy, was I happy I gave it a try! 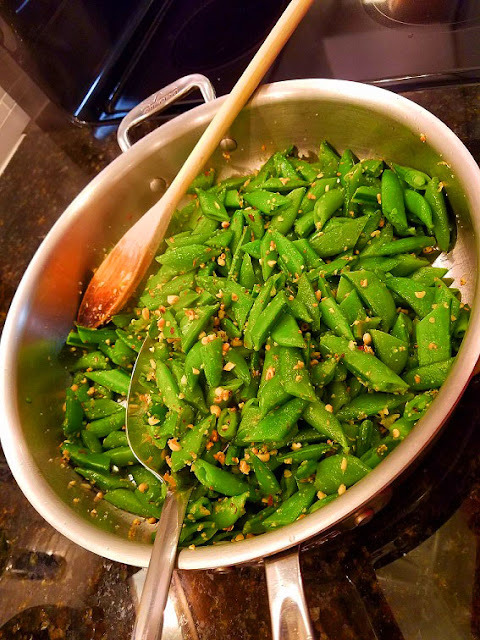 Hubs and I are eating more low-carb meals lately, and although sugar snap peas are not considered low-carb, they are a very healthy, side-vegetable to serve with a low-carb meal. In the past, sugar snap peas have been hit-or-miss for me. That is until I learned to cut the peas pods on a bias first before cooking first! This makes ALL the difference to ensure you don't end up with either tough, under cooked sugar snap peas, or soft, mushy sugar snap peas. All this yummy dish needs is a little water to steam crisp-tender and you are all set! Cut the sugar snap peas on a bias. Smaller pea pods can be cut in half at a bias. Set aside. 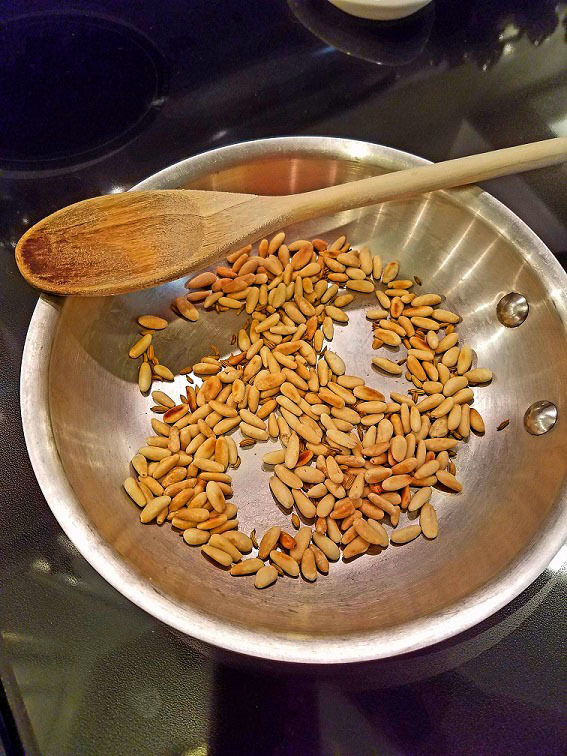 Next, dry roast the pine nuts in a dry saute pan over medium heat, just until they start to brown. 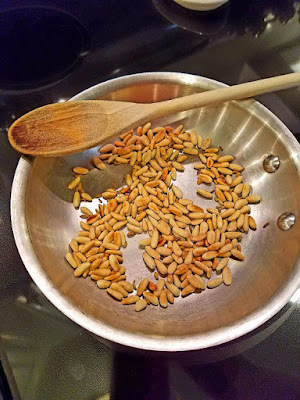 Add the fennel seeds and continue to roast for 2-3 more minutes, or until the pine nuts are a light-brown. Do not over cook, as they burn easily! 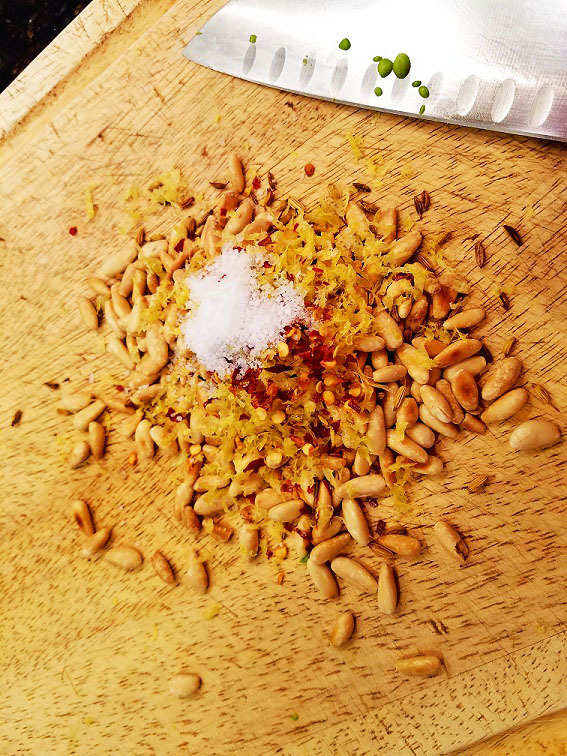 Dump the pine nuts and fennel seeds on a cutting board and add the lemon zest, pepper flakes, and salt. Mince this whole mixture together with a knife. Alternately, you can dump this in a food processor and give it a whirl or two. Don't over chop. Set pine nut mixture aside. Heat vegetable oil in a saute pan over medium heat until the oil shimmers. Add the sugar snap peas and 2 T of water; give a quick stir and immediately cover the saute pan with a lid. 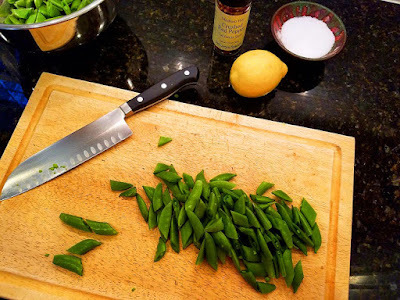 Let sugar snap peas cook for 2 minutes. Remove the lid and add the minced garlic and continue to cook, stirring frequently, for 2 more minutes, or until the water evaporates. Remove the pan from the heat and stir in the pine nut mixture and basil (I didn't have any for this pic) :-( Serve while warm and try not to eat the whole pan!